Link building or inbound marketing is a method used for digital marketing to increase website search engine rankings for specific keywords. 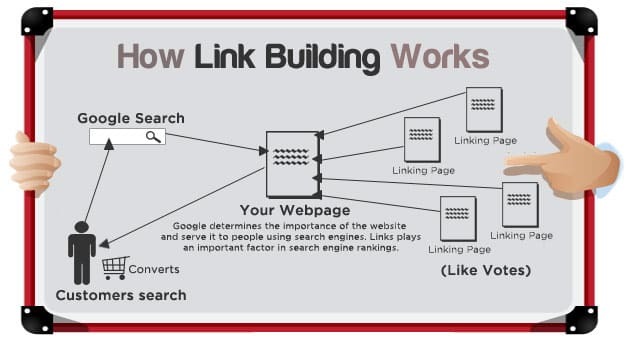 Link building is regarded by Google as an important ranking factor in their search algorithm. This is where an anchor text on one website links to another website and is referred to as a backlink. The more quality backlinks a website receives, the higher the search engine rankings are (among other ranking factors). For example, if you typed ‘Goalkeeper Gloves’ in Google, the search results on the first page usually identifies that these websites have a strong inbound link profile, or quality backlinks. will my website rank on Google with just backlinks? No of course not! There are many ranking factors involved with performing well on Google but a strong inbound link profile is very important. how many links should i build a month? There is no set number you should look to build on a monthly basis. It is important to try and keep the amount consistent and natural. Google will raise their eye brows if you create 3 backlinks one month, then the following month you create 1733 links! Always choose quality backlinks over quantity. One high quality, trustworthy backlink is worth more than a thousand spammy backlinks. Its worth spending that extra time to get a link from a high quality website. how do i know whats a high quality website? There are some free seo tools that allows you to view metrics about the domain but an experience link builder can tell just by looking through a site if its spammy or not. how link building has evolved. Inbound marketing has changed significantly over the years. Here is the history of link building so far. 1999 Link Exchanges – swapping links with other website owners. 2000 Email Requests – simply emailing site owners for a backlink. 2001 Directories – websites made with pages and pages of just categorised links. 2003 Blogging – commenting on peoples blog posts with a link included. 2004 Article Submissions – submitting low quality content to articles directories for a link. 2005 Blogrolls – just a standalone anchor text link in the sidebar of a website. 2006 Paid Links – paying for spammy links. 2008 Linkbait – making up fake stories for people to click on and go viral. 2009 Guest Blogging – submitting a higher quality blog post to another site for a link. 2010 Broken Links – website owners crawling other website for broken links and asking he webmaster to replace the broken link with a link to their website. 2011 Press Releases – distributing latest news to low quality news websites. 2012 Blog Networks – webmasters creating multiple websites, usually in the 100’s, in order to receive guest blogs for a link. 2013 Content Marketing – submitting an a snippet of your blog post with a read more link. 2013 Image Link Building – owner creates a quality image or infograph where whoever uses the image they must credit the owner with a link. 2013 Skyscraper Technique – searching Google for a specific, relevant blog post and rewrite the post yourself better than whats ranking. 2014 Surveys – creating specific surveys that news outlets and blogs could use with a backlink as being the source of the story. 2014 Brand Mentions – converting standalone brand text, eg, Evoleze, and ask the webmaster to convert it to an anchor text link. 2015 Influencer Marketing – individuals with high social media followers or website visits selling product or service promotion to their followers. onward… this is where digital marketing agencies get to shine and earn their money! Some of the above can still be used to a certain extend or evolved versions of it but a lot of the above will incur a Google penalty if you put it in to practice.